They say that a man’s best friend is his dog. For Pete (Fegley), it’s his dragon, Elliot. When he was just a little boy, he was the lone survivor of a fatal car crash that claimed the lives of his parents. The big green dragon appeared at just the right time when Pete was walking away from the crash frightened, scared, and not sure of where he was. The dragon scooped Pete up in his big furry paws and took him deep in the woods. For the next six years Pete lived side by side next to his only friend Elliot the dragon without an adult in sight. Back in the small village of Milhaven, Robert Redford’s Mr. Meacham works as a wood carver and tells the story of the time he met this dragon, which happens to be an urban legend in the town. His daughter Grace (Howard) works as a park ranger and doesn’t believe the tall tale as she has never once spotted Elliot in all her years of roaming around the forest. It’s Grace’s daughter, Natalie (Laurence), who spots Pete one day in the woods. After a frightful accident, Grace is rescued by Pete, which also means he is caught and taken in by Grace and her husband Jack (Bentley). Jack and his brother Gavin (Urban) work as lumberjacks working to tear down the trees where Pete and Elliot live. As Grace and her family work to learn more about where Pete came from, the mystery surrounding the dragon comes to light and has everyone out looking for him, while he leaves the woods hoping to be reunited with Pete. Disney has been riding strong over the last couple of years with their new live action remakes of their animated classics. After a rough stumble at the beginning, the last few like 2015’s Cinderella and The Jungle Book, which was released earlier this year, have been exceptional. Pete’s Dragon is their next reboot with the exception that the 1977 original was also a mix of live action with an animated dragon. Like those other two, the 2016 version is a crowd-pleasing joy. It is a semi-contemporized as it is set in the 1980s as opposed to the original that was set in 1900s. Also gone are Elliot’s purple hair, wings, and spikes. Writer/director David Lowery, best known for Ain’t Them Bodies Saints, tries to keep his version as original as possible without being a standard copycat remake. Lowery also shies away from the musical numbers and injects the film with a folksy soundtrack that felt appropriate and comforting. Frankly, there’s no need to rush out and watch the original if you can’t remember it. You can go into this one fresh without feeling like you are missing out on a hidden reference. One of the earliest thoughts that occurred to me was that Pete’s Dragon felt more stripped down and pure than what it may have been in the hands of other directors. I mean that as a good thing as Lowery remembers that sometimes less in more. I may not be making equal comparisons, but in terms of Disney’s remakes, Alice in Wonderland and Maleficent got bogged down in special effects and lofty CGI usage instead of getting to the heart of the story. Lowery never loses sight that at the heart of this movie is the friendship between Pete and Elliot. It’s evident from the very first scene as the young version of Pete is filled with such wonder and awe at the sight of the dragon. The animation given to Elliot makes him playful and huggable that instantly creates that bond between them that only grows as the movie progresses. Any child in the audience that has a pet will hopefully connect to the relationship between Pete and Elliot. Lowery also shies away from resorting to standard family movie character archetypes. Redford’s character is not the standard crazy old man that we’ve seen before in movies. He’s down to earth, completely sane, and isn’t mocked by everyone in town. Young Natalie has loving parents played by Bryce Dallas Howard and Wes Bentley. Bentley is not the tough stern dad often portrayed in these types of films. Technically, Uncle Gavin is the cruel villain of the movie. Another admirable quality Pete’s Dragon showcases is the importance of families and how families can come in all shapes and sizes. The film also poses as a gentle reminder of the effects deforestation has on the critters that live in the wildlife. 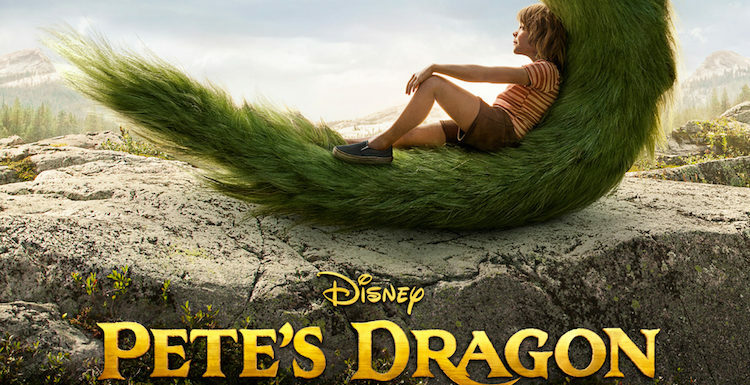 Pete’s Dragon is full of that good old-fashioned Disney magic that warms the heart. It made me think of those old Disney adventure films I grew up on. It doesn’t feel like an over produced blockbuster like many of their recent films. It should appeal to a wide audience, and thanks to Elliot’s lovable qualities, he’s not too scary for kids. There are some moments of peril during the climax where he breathes fire, but that’s the only moment that could be questionable. Hopefully, they’ll be on the edge of their seat waiting and hoping for Pete and Elliot to be reunited. Maybe even a tear will be shed. I know I got a little choked up at the ending. It’s a sweet and endearing story that doesn’t feel dated. I hope families flock to the theater and show that there is a need for this kind of smart, wholesome, and well-made family picture. If mediocre animated films like The Secret Life of Pets can make hundreds of millions, Pete’s Dragon should have the chance to earn Disney a few more million. Is It Worth Your Trip to the Movies? Disney’s done it again.